As usual, I am coming at this review arse-about. This film is a remake of a silent, twelve-part French movie serial that was released in 1916. I have not seen the original serial, so I have to look at the film as a stand alone piece, without the benefit and knowledge of having seen the original. That’s not necessarily a bad thing, because each film should be able to stand on it’s own, without the viewer being a learned student of French cinema. Since this film is a remake, I guess a little bit of history is required. Judex is the Latin word for ‘Judge’ or ‘upholder of the law’, and the title character is cloaked avenger who rights a few wrongs. 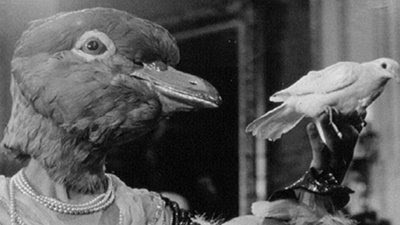 The original serial was directed by Louis Feuillade. Feuillade created the character (with writer Arthur Bernéde) as a response to negative criticism of two of his earlier serials, Fantomas and Les Vampires. This 1963 film, shot in black and white, and utilising inter-titles, is a loving homage to the original serial. The film opens on Mr. Favraux, who is a banker with a shady past. He has just received an ominous letter from somebody calling themselves ‘Judex’. The note reads: ‘Mr. Favraux, I order you to atone for your sins by handing over half your fortune to your victims. You have until six o’clock tomorrow evening to comply. Judex.’ Favraux pays little attention to the note, confident that ‘Judex’ is just a swindler trying to scare him. But non-the-less, Favraux hires Mr. Cocantin, a private detective to look into the matter. Favraux’s reason for hiring Cocantin is two fold. Not only does he have to investigate Judex, but also provide security for his daughter’s engagement party, which is being held on the following day. His daughter, Jacqeline is set to marry Viscount Amaury de la Rochefontaine. During the celebration, there will be a lot of people at Favraux’s chateau and he doesn’t want any trouble. Later that day, a vagabond turns up on Favraux’s doorstep. The man claims that he went to prison for Favraux, and in return his family was supposed to be ‘looked after’. Instead, Favraux allowed the vagabond’s wife to die destitute and his son to go missing. Favraux laughs off the man’s claims as that of a rambling lunatic. But later, he gets into his car and follows the vagabond. On a deserted stretch of road as the vagabond walks to town, Favraux runs him down, killing him. Upon his return to the chateau, Favraux receives his second communiqué from Judex. This time is says that if he doesn’t acquiesce to Judex demands then he will be struck down at midnight, on the following day. Jacqeline’s engagement party is a surreal affair. It is a masked ball, with many people wearing oversized bird-head masks. Favraux, himself wears a giant eagles head, which he takes off at midnight to make a speech to the assembled crowd. As he talks, he has a heart attack and dies. Afterwards, Jacqueline is to inherit all of Favraux’s money, but once she finds out how he acquired his wealth, she wishes no part of it. The same cannot be said of all of Favreaux’s servants. Marie Verdier, who worked as a tutor to Favraux’s grandchildren wants to get her hands on the money – or even the information with which Favraux had been able to use as leverage, while amassing his fortune. But this isn’t just a sudden shift in character for Marie Verdier. She is in fact, arch villainess Diana Monti, who controls a small gang of evil doers. When see isn’t tutoring, she is dressed in a black cat-suit and committing crime. Believing that the way to Favraux’s fortune is through Jacqueline, Diana hatches a scheme to capture her. In town, posing as a nun, Diana injects Jacqueline with a potion that knocks her out. Then acting as a good Samaritan, she offers assistance and then spirits her away in the back of an ambulance. I have already mentioned that the original Judex was made by Feillade in response to negative criticism to his Fantomas serial. There’s a nice little scene that goes to lengths to point out that Judex and Fantomas are the antithesis of each other. 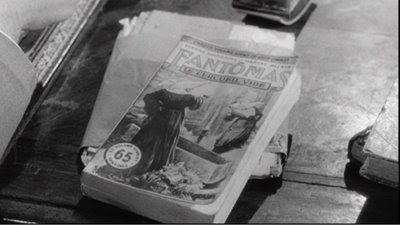 During the scene, Detective Cocantin is reading aloud a scene from a pulp Fantomas novel. 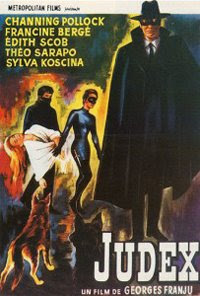 The scene he describes features both Fantomas and Commissioner Juvé dressed as nuns. 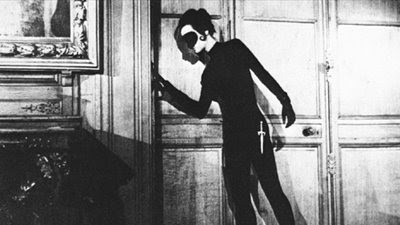 Juxtaposing this scene, with the scene of Diana Monti posing as nun, is it fair to assume that Diana is Fantomas? But back to the story – now Judex has his hands full tracking down the ever resourceful and beguiling – but totally evil – Diana and rescuing Jacqueline. Judex as a hero, or avenger, is pretty piss-weak. Whenever there is trouble, he sends somebody off to get men from the town rather than handling the situation itself. When later, he actually gets involved in the action – that being smashing through a window to surprise the villains – he immediately gets clocked over the head with a piece of firewood, and subsequently captured. If you want heroics, you have to wait for the eighty-two minute mark in the film, when a circus acrobat named Daisy enters the picture. Daisy is played by Yugoslavian beauty Sylva Koscina – and for me that sufficient reason to watch this film (over and over). As Judex has been captured, someone must save the day, and it’s Daisy who scales a wall, dressed in her skimpy acrobats costume, and then takes on the diabolical Diana Monti (or should I call her Fantomadame?) in a life and death battle on the roof of an old dilapidated building. The last twenty minutes of this film is pretty good and we ‘finally’ get the payoff that this film has been promising during its whole running time. Unfortunately, this film is a homage to the original serial, and while it may be considered a fantastic re-envisioning for fans of that serial, for newcomers like myself, the visual shorthand employed in the film, at times renders the plot almost in comprehensible. I guess this is the price you pay when you condense a three hundred minute serial into a one hundred minute film. But I guess similar visual shorthand is used in the Sherlock Holmes films, which many of us are more familiar with. Very little time is taken to establish who Holmes, Watson and even Professor Moriarty are, because we are familiar with the characters. Just a shot of a man in a deerstalker hat and cloak says so much. Maybe in France, seeing a gent, dressed in black, with a long flowing cloak and a wide brimmed hat says volumes, and very little exposition is needed. Personally, in this film, I wanted to spend more time with Judex and find out who he was – why does he do what he does. These elements were not sufficiently explained. While I am not willing to can Judex, because my knowledge base is poor, and possibly culturally I am not in tune with the character, I found the film to be rather cold, lacking action and adventure – which is what you want from a mysterious cloaked avenger – and its storyline muddled. Its biggest crime though, is that Judex isn’t on the screen enough, righting wrongs. C.O.B.R.A.S DISCUSS COSTUMES ALL THIS MONTH! The Coalition Of Bloggers wRiting About Spies have teamed up this month to explore the fun and flair of Spy Costumes. Double O Section kicked off the month with an excellent series on costumed heroes. In the second week Spy Vibe followed with a series of articles and video clips: Mods To Moongirls. Next week, the coalition series will wrap up with Armstrong Sabian at Mister 8.